DHI – Direct Hair Implant: A new method for hair restoration? When talking about hair transplant and its methods the business has regularly presented a number of clinics and advocates to compete with noted physicians by presenting own or new innovations. A new marketing strategy is often aggressively launched to compensate an existing competition drawback. The words “DHI“, standing for direct hair implant, are still contributing to a greater diversity of opinions. Time for us to shed some light into the darkness and clarify the background. Clinics and DHI supporting physicians are often promising the most natural and successful results with hair transplantation performed via DHI technique. In their words DHI allows for complete control of the growth direction, the shortest recovery time, a higher density and – above all – the highest growing yield in the business. All that shall be achieved by a process to instantly relocate extracted hair follicles from the donor to the recipient site and providing blood supply as quick as possible. The method being used with DHI is upon closer inspection inspired by the present state-of-art-technique FUE (Follicular Unit Extraction), which is actually being performed by almost all noted hair surgeons in the industry. As with FUE (Follicular Uni Extraction) hair follicles (grafts) will individually be removed from the donor area of the patient DHI (Direct Hair Implant) allows to specifically relocate extracted grafts to the balding area. This is why a number of promises made with DHI mainly refer to the FUE-process. Regarding the extraction process many physicians are using a motorised punch provided by numerous brands to boost the workload or prevent fatigue. In many clinics an automated punch will also be used to compensate an existing lack of practical experience and personal skills. Clinics and hair surgeons performing DHI therefore refer to a number of pros during the extraction process being performed via FUE (follicular unit extraction) to be preferred over outdated methods like the strip surgery. What happens during a DHI session? 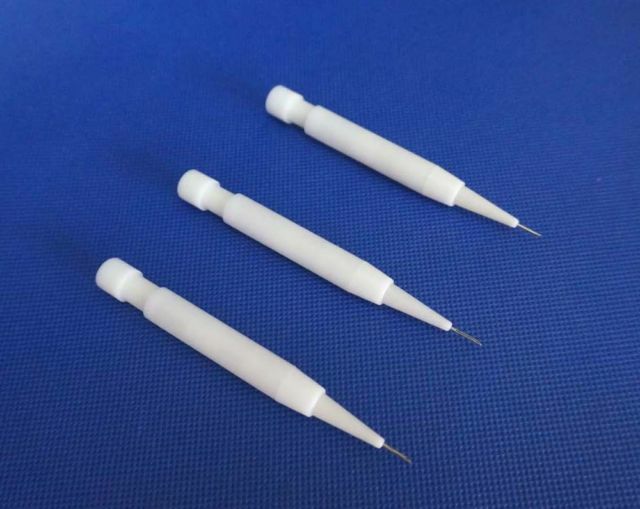 features a plunger device and a fine hollow needle on the tip to prepare the incisions and simultaneously place the grafts at the recipient site. The entire innovation that comes with DHI is this part of a regular procedure which combines the extraction process with the implantation of grafts. Are promises kept with DHI? What are the real benefits? 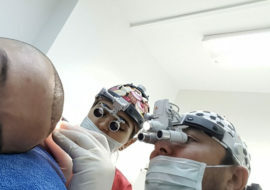 To start with there is no conflict nor any contrast between DHI and FUE since FUE (Follicular Unit Extraction) will be performed during a regular DHI-hair-transplant when removing hair follicles from the donor site. Extracted grafts will instantly be sorted and prepared for the relocation process. Each DHI-pen will then be filled with hair follicles to both make the incisions and embed the grafts at the balding area. Patients should be aware that during the whole hair transplant procedure every two parts of his head will constantly be under medical treatment: both the donor area and the recipient site. With DHI hair follicles will be without blood supply for a significantly shorter time as with other methods being performed step-by-step. Patients undergoing a DHI hair transplant will be exposed to discomfort and higher stress resulting from the fact that several areas of his head will simultaneously be under medical treatment. Local anaesthesia will be needed for both parts of his head at the same time. For an immediate / simultaneous relocation of hair follicles to the recipient site the hair surgeon would have to instantly switch from the extracting process to the relocation process. This is why medical assistants are often involved in the relocation process with many clinics to finally place the grafts. Based on recent scientific research (FUE Europe) there is no proven evidence that the survival of grafts being removed from the donor area will be harmfully influenced in case hair follicles are properly stored upon medical standards for the transition. In most cases, it´s the extraction process and the method chosen being responsible for a higher or lower growing yield with hair transplant. This is why there is no medical need for a method to simultaneously perform the extraction and implantation while utilizing a DHI Implanter. The blood supply of human grafts will sufficiently be guaranteed with regular FUE hair transplants when being performed in a step-by-step procedure with a lower number of grafts. After 500 or 800 grafts are successfully removed from the donor area the hair surgeon will be able to start with the relocation process and follow this routine until the end of the procedure. In case physicians are performing both the extraction and the relocation process at the same time the number of grafts being redistributed within a daily procedure may be significantly lower than with regular hair transplant methods. The DHI-method is extremely time-consuming and stressful for the hair surgeon which may result in a considerably lower workload. Those having enough personal experience and individual skills to successfully perform hair transplants with a manual punch will soon notice the limits of a daily workload. This is why most clinics performing DHI are using a motorised punch for the extraction process to boost the removal of grafts. Other than that physicians will have to rely on an extended medical staff to accurately perform the implantation of hair follicles which may result in higher costs for the patient. Hair follicles can be harmfully damaged or injured while being fitted into the DHI-pen (Choi-Implanter) if it is performed without the utmost care, accuracy and experience. This may also affect the growing yield of a hair transplant. Generally speaking DHI needs a long-term experience and training unlike the promises will suggest. – A question of faith: Lateral slit or needles! It has almost become standard to create incisions at the recipient site (e.g. the receding hairline) by either the use of little needles or lateral-slits. Regarding both methods there is no significant difference concerning the healing time. It may appear rather absurd to claim that the use of the Choi-Implanter (DHI-pen) may result in a higher growing yield or shorten the recovery time of the patient. Since healing and regeneration of several skin layers are not affected by the use of a pen instead of fine precision scalpels it is more likely to be a successful marketing strategy that allows the business to promote a DHI-pen which is being used by only a minority of hair surgeons. 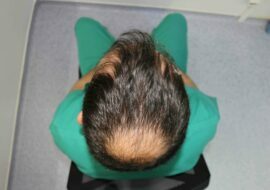 Practical and long-term experience, personal skills and artistry of a hair surgeon have always been the keystones for success to provide outstanding results with hair transplantation. The growing yield may not be influenced by the use of a pen to embed the grafts directly into the balding area. Most of all noted hair surgeons in the business still continue to prepare incisions via lateral-slit or some hollow needle without the need of a DHI implanter to simultaneously implant the grafts as this will only cause stress and damage while handling the follicles. As for scarring there is no proven evidence that the use of a Choi-Implanter may result in less visible or non-visible scars. 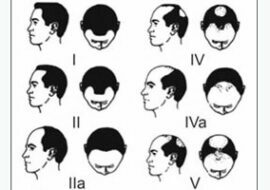 Both the direction and the growing angle of grafts will necessarily depend on an accurate placement of the hair follicles. Unnatural appearances and poor results have typically been noted by doctors with lower or no experience and with numerous low-cost providers. There is doubt that devices such as the DHI implanter may help to prevent these results as it unwillingly may attract a greater number of unqualified doctors to perform hair transplant with the implanter pen without having the necessary experience or skills. Long-term experience and practical skills are mandatory requirements to achieve natural and aesthetically pleasing outcomes.